On Friday February 8th, 2013, André appeared in a radio interview on the 3FM Radio station. DJ Giel Beelen talks with André about his cooperation with Jermaine Jackson and other "Friends" whom he will invite to perform in the 2013 Maastricht concerts. In the second half of the interview, André shows art of the song he recorded the day before with Jermaine. Giel: This is fun. It is Limburg you know. 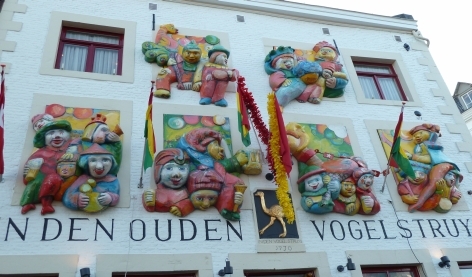 All of Limburg is totally inaccessible because of...… people have already started to celebrate carnival. I'll play a carnival song now. Not really, but it is called "Carnival of Venice", played by Andre Rieu. And what is he doing at the moment? Something very special! We are in contact with your studio, it sounds so "hifi", great! -Well, it is just at my home. Fantastic. How are you doing? Wow, you started to work out again after your collapse. Currently, in the last few days you have been busy with Jermaine Jackson. - Yes, that was a big surprise when he was in Antwerp in November 2012 for a concert, he came by and said that he would like to do something with us. His computer appeared to be filled with all of my music. He is a very nice person being around and working with him. Yesterday we recorded Autumn Leaves, and lots of tears flowed. -Hah,ha, it was so beautiful! His voice is most like Michael's. Let's hear a part! Just to be clear: this is the original version by Nat King Cole. André, is this meant to be your CD or his? Who is working together with whom? - I am working on a CD named "Andre Rieu and friends", which will be released in the fall of 2014. And he is the first friend. Which other friends are you thinking of? - Lionel Richie, Chris Deburgh, Barry Gibb. Are you just thinking about them or has everything already been arranged? - No, it is arranged. They are confirmed, but they still have to come. - Yes, and all of them are going to perform on the Vrijthof this summer. I cannot say which star on which night, so that will be a big surprise for the audience. Who will perform tonight? Every night a different special big star guest in your concert? How wonderful. Before the summer we'll speak with each other again. I wonder: "Wie sjoen os Limburg is....."
- Yes, I hear it. What do you think is the loveliest village of Limburg? - Maastricht, I would say of course! I was thinking: I have seen your house on the hill and thought: Is that still in Maastricht or in a neighboring village? 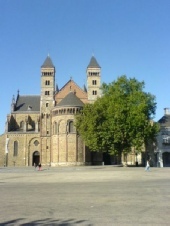 - No, it is in Maastricht, but just like many cities, they have incorporated many former neighboring villages, and we live in "Saint Peter". That is the most beautiful village in the Netherlands. Yes, that's it: St. Peter. Being a real Limburger, what are you most proud of? - The fact that I was born here, I live here, and I hope to die here sometime, but not yet! What is the most beautiful sound of Groningen (slip of the tongue), sorry: Limburg?? - The most beautiful sound in my opinion is: Grameer. - Grameer is the Maastricht dialect for "Grandmother". 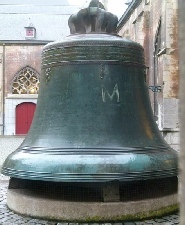 That is the biggest bell of the Servaas church carillon. 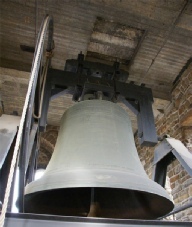 A gigantically large bell, and it sounds so impressive, when occasionally being rang only on festive days. That gives me goose bumps. Talking about sounds: Can you let us hear something of what you are doing now with Jermaine? -Yes, in half an hour I can put it on my computer, and I'll try and hold the mike in front of it. Okay, see you again in half an hour! I am in contact again with André Rieu in his own studio in beautiful Limburg. Are you there André? - Yes I am here. 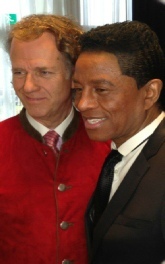 Are you celebrating carnival with Jermaine Jackson? - Yes, we are going as André Rieu and Jermaine Jackson. Okay, nobody will believe that. I like to see how we can pull that of..!! Half an hour ago we talked and you said: Wait for a while because I have to put that on my computer, so you can listen. The song of Nat King Cole. - Here it comes. Oh no, it does not work.... Oh Yes! Can you hear it? This is the introduction. Now here it sounds a bit like Michael Jackson. How wonderful. Did you convince him to come to Maastricht for one of your concerts on the Vrijthof? In principle he is now finished or will you be doing other recordings? - Today we'll record "When the rain starts to fall". And I composed a song named "Dreaming of New Zealand". He listens to this song all day long on his computer. Marjorie wrote the lyrics, and he would love to sing that. So maybe we'll record this during the carnival days. Did he bring an entire crew? - No, he is just by himself. Tonight he'll have dinner with us. Very cozy. I'll fix chicken soup and he can be my assistant. As soon as more of these heroes come to your studio, please let us make contact again! Very special! Will you please finish with a real good morning in Limburg dialect? - "Good morning to all of you and I hope you'll have a great carnival "Vastelaovond". For the fans of the Jackson 5 / The Jacksons, we found a YouTube video of Jermaine Jackson, singing on Michael's memorial service in 2009. February 24th, 2013: Officially announced in the papers: Jermaine Jackson changed his family name into Jacksun, for artistic reasons. Jo Cortenraedt interviews Jermaine Jacksun. Watch the video below. 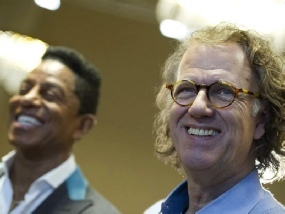 Michael Jackson's brother Jermaine was in Maastricht rehearsing with André Rieu and the Johann Strauss Orchestra. Dutch TV programs RTL Boulevard and Show News both broadcasted interviews from the Rieu Studio in Maastricht. 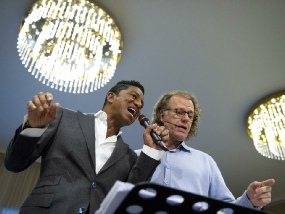 Jermaine and André Rieu were rehearsing for the new album "André Rieu and Friends" (to be released in 2014). We made one video out of the two interviews and we thank John for his assistance with the English subtitles.